Nurturing Minds benefits significantly from home-grown small-scale fundraisers. Our supporters across the country organize numerous events throughout the year to raise money and spread awareness for Nurturing Minds. Today we are highlighting Bags for Books – one of the projects that consistently works to benefit Nurturing Minds! Angela McManus, the founder of Bags for Books, originally learned about Nurturing Minds and SEGA from her neighbor in 2013. Inspired by SEGA’s mission and community of supporters, Angela began sponsoring two SEGA students. Over the next few years and many letters back and forth, Angela grew close with her sponsored students. In 2015 Angela visited SEGA for the first time to see her sponsored students graduate. Angela’s visit to SEGA got her hooked! Meeting SEGA students, teachers and staff in person, experiencing SEGA’s energy and witnessing SEGA’s impact deeply inspired Angela. Back home in California, Angela decided to sponsor two more students and get more involved with Nurturing Minds. Through a consulting job with a local fabric design company, Angela found herself with copious fabric swatches and discontinued fabric. She and her sister had an idea. 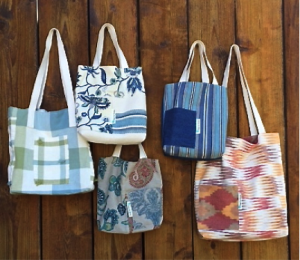 She decided to sew beautiful bags from the fabric and donate 100% of the proceeds to Nurturing Minds. The fabric is sturdy and 100% cotton — perfect for carrying books. Hence Bags for Books was born! Since 2016 Angela has made an estimated 263 bags and to date has raised over $3,000 to benefit Nurturing Minds. Angela most recently visited SEGA this past summer with many family members. She continues to be a passionate supporter and creative sponsor for SEGA and Nurturing Minds – thank you Angela! If you would like to sell Bags for Books or know of a partnership that would be interested in selling Bags for Books to benefit Nurturing Minds we would be happy to supply you with Angela’s hand-made bags. Please email info@nurturingmindsinafrica.org for more information or to discuss a home-grown fundraising idea of your own!